It’s hard not to be excited today as we mark the 44th free and peaceful transfer of power to a new President. Mrs. E. and I will be celebrating at a “Party Like a Barack Star” get-together this evening. One of her gowns will grace a neighbor as she attends the Mid-Atlantic Inaugural Ball. Where, I hope, that she will be served appetizers half as wonderful as those prepared by The Archtiect for a dinner party we had this weekend. I’ll let him tell you how to spread a little cheer the next time you would like to bring a dish. Roll out the dough and cut out 12 “two inch” circles (I use an old chipped Baccarat glass). Place each circle of dough in a small muffin tin (previously buttered). Add one teaspoon of the cream cheese (+ or -), a slice of tomato, a bit of onion, grated cheese and spices. Bake at 350ºF for approximately ten – fifteen minutes. These tiny tarts should be served with cocktails. Take slices of day old white bread or whole wheat bread. Cut each slice into circles using Grandmother’s Baccarat glass tumbler (no substitutes); flatten out each circle using a rolling pin. Brush each bread circle with cheap olive oil. Press the circles into the miniature muffin tins and bake in a slow 200ºF oven until each circle becomes light brown and crisp. Remove each shell and fill with anything you wish. Note: it is best to place cheese in the bottom of each shell to prevent the shell from becoming soft. Try: Cream cheese with chutney. Goat cheese and a walnut. Clotted cream and pepper jelly. Or sauté chopped onion, red peppers and mushrooms in butter; top each filled shell with cheese. Melt diced cheese, olives and mayonnaise. Or fill with chilled salsa and sour cream. Top with chives. These can be served hot or at room temperature. 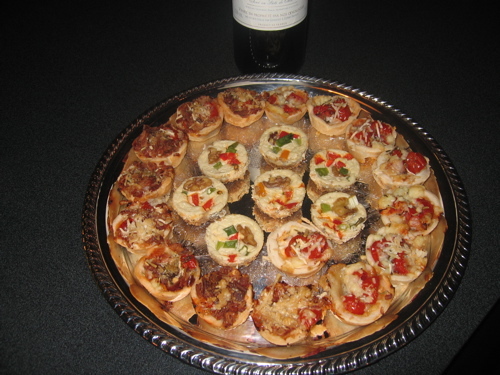 This entry was posted in Entertaining and tagged appetizers, Entertaining, recipes. Bookmark the permalink. Yummy! Have a wonderful time! It’s a great day! Thanks, atb. It is very stirring. Great day! Great hors d’oeuvres! I could have appetizers for dinner every night – as my entire dinner. I love them! This is not a good post to read at 9:49 at night, the pictures are making me hungry! such a tease…an appeteaser! I love appetizers.